November 13, 2018 Rev. Robert Moeller, Jr.
“But in fact Christ has been raised from the dead, the firstfruits of those who have fallen asleep. For as by a man came death, by a man has come also the resurrection of the dead. For as in Adam all die, so also in Christ shall all be made alive. But each in his own order: Christ the firstfruits, then at His coming those who belong to Christ. Then comes the end, when He delivers the kingdom to God the Father after destroying every rule and every authority and power. For He must reign until He has put all His enemies under His feet. The last enemy to be destroyed is death” (1 Corinthians 15:20–26). This weekend we observed the 100th anniversary of the end of World War I. The “war to end all wars,” it was optimistically, if not naively dubbed. At first idealistic, the term has become quite ironic. In the 100 years since the Armistice was declared with Germany on the 11th hour of the 11th month, our own country has fought in World War II, the Korean War, the Vietnam War, the Cold War, the Gulf War, and is still involved in wars in Afghanistan and Iraq. It seems that the moment one would-be dictator is deposed, another takes his place on the world’s stage. Another war begins in the futile attempt to end all wars. But there’s a much deadlier war going on. A spiritual war that has been going on for centuries—ever since the fall into sin in the Garden of Eden. It’s the battle of the Seed of the woman and seed of the serpent. Good vs evil. God vs Satan. And the toll that it has taken is enormous. Thousands of years with 100% casualty rates. For as we know, the wages of sin is death. And all have sinned and fall short of the glory of God. All have followed the path of Adam: From the dust of the ground you came, in the ground to dust you shall return. The fact that death is our spiritual enemy has immense significance for us Christians, especially on a day like this. Sometimes at funerals, one hears comments such as these: “We shouldn’t be sad; we should only rejoice. God blessed her with many years. Her suffering is over. This is a victory celebration.” To be sure, there is a sense in which this is true. But death, the last enemy and sign of sin’s universal dominion over fallen humanity, will not be swallowed up until the Last Day, and Christians are free to grieve at the death of their loved ones. Even the 90 years that God granted Veva to serve her family and community, to share her joy of music by teaching piano and playing in church are a drop in the bucket compared to our Creator’s plan for us. God never intended the pain of separation and the heartache that attends death. That sharp pain of grief can be an entirely appropriate manifestation of the biblical understanding that death has not yet been fully overcome. And so, Christians may and should mourn at funerals—but not as those who have no hope (1 Thessalonians 4:13-18). But there’s Good News on the battle front! The fight is over. The battle won. Christ is risen. Death is defeated. Oh, I know, it doesn’t look that way on a day like today. The evidence suggests otherwise. The flowers in the nave. Veva’s mortal remains lie in the casket before us—one of the latest casualties in the conflict of the ages. In less than an hour, we will be committing her body to rest in the ground. But God’s Word clearly declares that death has been defeated! That victory was won about the 9th hour of the Friday we Christians call Good. In the darkness, when Jesus drew His last breath and shouted, “It is finished!” Again, it didn’t look victorious at all, but that was the end of death’s reign. The sting of death is sin and the power of sin is the Law. Jesus fulfilled the Law. Jesus absorbed the power of sin by becoming sin. Jesus took the sting of death into His own flesh. The Law is fulfilled. Sin is judged. Death lies defeated. Easter is not the victory. Good Friday is. Jesus’ death is the decisive victory when death swallowed up life and lost. But without the resurrection, the victory remains hidden. Without the resurrection, we wouldn’t know Jesus from Adam. But Christ is risen, the firstfruits of the dead. He unbarred the gates. He broke the chains. He threw open the prison doors. The stone is rolled away. The burial clothes are folded neatly. The tomb is empty. Jesus has risen. Every harvest has firstfruits. The first strawberries of spring. The first tomato of summer. The first wheat and corn and soybeans of the harvest. Firstfruits mean more to come. Jesus is the firstfruits of those who have fallen asleep. He’s the first of the dead to rise. But there’s more to come. Many more. For Christ, the resurrection took place almost 20 centuries ago. For those who have believe in Him, the resurrection will take place when He returns in glory on Judgment Day. The first sheaf was from a grave outside Jerusalem on the first Easter morning nearly two thousand years ago. The harvest will be from graves all over the world when our risen Lord will appear on clouds of glory, and His own will rise from their graves and will be caught up to meet with Him in the air. “As in Adam all die, so also in Christ shall all be made alive.” When Adam fell, humanity fell. When Adam sinned, humanity became a sinner. Death came into this world through one man, Adam. His death was the death of us all. His sin is our sin and our captivity. That is why Christ had to come as man. That is why the Word had to become flesh to dwell among us. Humanity needed a new head. A new Adam. A second Adam who was like the first and not like the first. Like us in every way except for sin. A sinless Adam who would do what the first Adam did not do and what we in Adam cannot do. The battle is won, but the war is not yet over. There are still border skirmishes, pockets of resistance, enemy soldiers lurking. Even after the Armistice was declared, the battles continued as generals tried to take more territory before their troops were withdrawn. We still get sick, still have accidents, still grow old, and we all die. We are born of Adam, children of Adam. We are conceived and born with Adam’s inherited sin. Birth is one hundred percent fatal. Everyone enters this world with an expiration date. But Christ has conquered death on behalf of fallen humanity. Christ is humanity’s new head, a humanity that is destined to rise on the Last Day. That doesn’t mean that all rise to eternal life. It does mean that all rise. Those, like Veva, who trust in Christ and His merits rise to eternal life. Those who trust in themselves and their works rise to eternal condemnation. But all rise. All humanity is caught up in the victory of Jesus and no one is left behind. What Christ has won for all, He gives in Holy Baptism. Through the water and Word, Veva was adopted into the family of God, made a co-heir with Christ of all the treasures of His kingdom, including forgiveness, salvation, and eternal life. In Baptism, she was declared by God dead to sin but alive to God in Christ. She was buried with Christ in His death and raised to new life in His resurrection. What happened with Jesus in His death and resurrection is now made yours in Baptism. You are dead and you are alive. Dead in Adam and alive in Jesus. Jesus’ victory over death and sin and the Law are yours. God has granted it in His name. The last enemy has been conquered! How pitiful it is when Christians talk as though Jesus was nothing more than a crutch to lean on. How pitiful it is when Christians live in cowering fear of death and the grave in full view of Jesus’ open and empty tomb. How pitiful it is when we act as though our puny hold on this life is all there is and all there will ever be. Jesus’ resurrection proves that death isn’t the worst thing that can happen to you! Christ is risen, the firstfruits of the harvest of the resurrection! “Firstfruits” means more to come. A future. A destiny. A hope. For Veva. For you. Though you die, yet in Christ you live. And living and trusting in Christ, you never die forever. There is now and there is not yet. Now we live by faith in the Son of God. Now we live trusting God’s promise of life in Jesus. Now we live believing that we no longer live, but Christ lives in us. But there’s a coming day, a great day, a glory day, when we will see with resurrected eyes what we must now believe and take God at His Word. The end, the Last Day, when every temporal rule and authority and power will be destroyed, when every dead will rise, and every tongue confess Jesus Christ as Lord to the glory of God the Father. “He must reign until He has put all His enemies under His feet.” Christ has enemies. The war still rages on. The devil, the world, and our sinful flesh still tempt us, causing us to doubt, to disbelieve, to wander from the flock. We forget the open, empty tomb and live in servile fear of death. We bargain with false religions and quack cures trying to cheat death. We live in denial, as though death were an illusion. We forget the promises God has made for us in Jesus Christ. The victory is won, the outcome is guaranteed, but war rages on. It is not a war against flesh and blood. It is not a war fought with bullets and bombs. It is not a war fought by power and might. It is not a war that we fight, but one that Christ fights seated at the right hand of the Father. He is restless to put all His enemies under His foot along with the head of the serpent. And He fights that battle with the Word of His mouth and the fiery breath of His Spirit. That’s how this war is fought. Word and Spirit. Word and Sacrament. Baptism. Body. Blood. Forgiveness. Holy Church. Holy Ministry. That’s how the Son of God fights His war against every rule and power and authority. And that’s why it’s important for you to come to the place where He promises to give these things—the Church! At the end of World War II, there were Japanese soldiers on isolated islands in the Pacific who did know the war was over. They did not realize they had been defeated. They were still fighting a war that had ended years before. Someone had to tell them, and it wasn’t always safe. They were at war. That’s what you and I do in the world. We tell the people we meet that the fight over sin and death is over. The battle is won. That’s why we gather here in the Lamb’s foreign embassy, the Church to hear it again, over and over and over again. To be reminded, that this fallen world and this broken life is not all there is. To be encouraged to stay strong and ready to the end. The best is yet to come. The last enemy, death, is destroyed. Christ is risen! The grave has lost its sting! On the Last Day, all the dead will rise, and Christ will bring Veva, Gordon, you, your loved ones, and all who die in the faith to be with Him forever in the new heaven and the new earth. Amen! The peace of God that passes all understanding guard your hearts and minds in Christ Jesus unto life everlasting. Amen. This sermon is based upon an Easter sermon by William C. Cwirla. September 18, 2018 September 17, 2018 Rev. Robert Moeller, Jr.
Click here to listen to this sermon.“Out of the depths I cry to You, O Lord! O Lord, hear my voice! Let Your ears be attentive to the voice of my pleas for mercy! If You, O Lord, should mark iniquities, O Lord, who could stand? But with You there is forgiveness, that You may be feared. I wait for the Lord, my soul waits, and in His word I hope; my soul waits for the Lord more than watchmen for the morning, more than watchmen for the morning. O Israel, hope in the Lord! For with the Lord there is steadfast love, and with Him is plentiful redemption. And He will redeem Israel from all his iniquities” (Psalm 130). Our text begins at the place where a man’s life is being overwhelmed, inundated, and flooded. We might imagine being in a small boat on a lake when high winds strike and the waves consume the craft in an instant. One minute you’re safe inside the boat, and the next moment you’re swept away. While drowning is not a particularly pleasant death, it is generally quick. You don’t have a lot of time to ponder death. But imagine an overwhelming death that takes a long time, as your stranded boat floats nearly submerged over a period of years. The water up to your nose. There you are, right at death’s door, but never quite going through it. And while you wait, what do you say to God? That’s what it must have been like for Dorothy in the last few years of her life. Only instead of it being water that rose to overwhelm her, it was Alzheimer’s. That dreadful disease took away her ability to do the things she enjoyed—serving people and volunteering. Eventually it took away even those basic things most of us take for granted—eating, drinking, walking, and even the ability to engage in conversation. That was frustrating for everyone involved, I know, but it had to be especially frustrating for Dorothy because she lived with it all the time. About two months ago when I visited Dorothy, she surprised me. I asked her if she would like me to read some Scripture. “Yes, I would,” she said. Somewhat shocked to find myself in a two-way conversation, I could only say, “Okay.” I would have to say that that’s the only time in the last few years that Dorothy ever had more words to say to me than I had to say to her. During my visits, I reminded Dorothy that, no matter what, she could always talk to God with the thoughts and prayers in her mind. I told her even when we didn’t know what was on her mind and heart, that the Lord heard her silent prayers and her cries for help. I reminded her how the Holy Spirit helps us in our weakness and intercedes for us with groanings too deep for word. And I reminded her that the Lord loves her. He would never leave her nor forsake her. He had promised to be with her always, and the Lord always keeps His promises! The answer is a firm, “No!” No one could stand. I couldn’t. You couldn’t. Dorothy couldn’t. Not one of us could stand in the Judgment by ourselves. We’re all sinners and deserve to be consumed, overwhelmed, and drowned in the depths of the eternal Lake of Fire. And that’s a whole lot worse than any physical affliction any of us will ever experience. The psalmist points us to the only solution to our problem of sin, “But with You there is forgiveness.” Dear friends, Jesus, the Son of God, brings us that forgiveness. In love, He takes the guilt, the shame, and the punishment of all our sins to the cross. Jesus endures all the shame, pain, and grief that others have laid on us. There, on the cross, Jesus pays the eternal price for all our sin as the wrath of God is released upon Him instead of on you and me. To those like Dorothy, and you, and I, who know the Savior, and who trust in Him, the message of forgiveness becomes ours through Baptism and the Word. Baptized into Christ’s death and resurrection, we live in daily contrition and repentance. Invited to the Lord’s Table, we receive His body and blood, in, with, and under the bread and wine, to strengthen and preserve us in body and soul unto life everlasting. Having been forgiven our many sins, we forgive those who have sinned against us. Having been adopted as God’s dear children, heirs of His kingdom, we gratefully look for ways to serve our heavenly Father and His kingdom now. Trusting Jesus’ promise that He has gone to prepare a place for us, we patiently wait for our Lord to bring us home one future day. The psalmist urges, “O Israel, put your hope in the Lord.” At all times, but especially at times such as this, the Christian’s hope is in God and in His Word. The Word of God’s promises in Christ are what will sustain us with the hope that does not disappoint. Though we mourn Dorothy’s passing from this earth and will miss her dearly in the days and years ahead, “we do not grieve as those who have no hope.” We believe that Jesus died and rose again, and that for His sake, we will also have eternal life. On the Last Day, the Lord Himself will come down from heaven, and Dorothy and all the dead in Christ, will rise, and we will be caught up together to be with the Lord forever. Then Dorothy will be able to say all those words she’s wanted to say to you during the past few years of silence. You’ll have eternity to catch up. And together Dorothy, you, I, and all believers in Christ will be able to give praise and glory to God forever. Amen. Now may the peace of God that passes all understanding guard your hearts and minds in Christ Jesus unto life everlasting. Amen. July 30, 2018 Rev. Robert Moeller, Jr.
“For we know that if the tent that is our earthly home is destroyed, we have a building from God, a house not made with hands, eternal in the heavens” (2 Corinthians 5:1). It’s easy to understand why this house of the Lord would be important to Paul. This was the place in which he was baptized, confirmed, and married, Paul’s children were baptized and confirmed here at St. John’s. Paul served as a Sunday School teacher, church officer, and elder for many years in this place. Here in this place, Paul joyfully and heartily sang the praises of God. Here, week after week, Paul heard God’s Word proclaimed and received Christ’s body and blood for the forgiveness of his sins and the strengthening of his faith. But today we’re not going to focus on this place, this house made with human hands. I want to spend more time talking about a “building from God, a house not made with hands, eternal in the heavens” and the place that Jesus has prepared for His followers. St. Paul describes life now in this body as a tent—“the tent that is our earthly home.” It’s fading. It falls apart. It’s damaged by time, elements, and toxins. Really, the problem is that it’s a victim of the wages of sin. For a while, it’s a source of groaning. Eventually it is destroyed because the wages of sin is death. So your body preaches sermons to you all the time—sermons of law. The sore throat and stuffy nose of a cold. The ache of arthritis or overtaxed joints. Toothaches. Allergies. The heartbeat that flutters now and then. Cataracts. We’ve each got our own list of pains and maladies: all of them preach that far from indestructible, we’re fragile and vulnerable. All of these remind us that the tent doesn’t last forever. And while that is a sad fact to contemplate, it is a very necessary lesson. You see, you and I are, by nature, very much materialists. I don’t mean that we love material things more than we should, even though that’s often the case. Rather, I mean that we believe that material things are more real than immaterial things. In this case, your body is the material thing: you can see it, feel it, suffer its pains, enjoy its exhilarations. Because of that, you’re tempted to believe that your body is far more real than the soul—which you can’t see, feel, suffer, or enjoy. Because you’re so much more aware of, and attuned to, your body, you’re then tempted to judge life and God by how well your body’s doing. If your health is good and your body is in good shape, then life is good and God is good. But if your health is bad and your body is failing, then life is bad and God is failing you. It’s easy to fall into this way of thinking for materialists like you and me. We tend to think of ourselves mainly as bodies that also happen to have souls. But I propose to you that we are more souls that have bodies than bodies that have souls. We are souls with bodies—the soul is real and the soul is important. We can’t see it, but that doesn’t diminish its worth. In fact, it is more valuable than most of those things we can see. Jesus says in Mark 8:35: “For what does it profit a man to gain the whole world and forfeit his soul?” If your body is in great shape but your soul is stained with sin, you’re condemned. If your body is in poor shape but your soul is cleansed by grace, then heaven is yours forever. It’s an important point, but there’s another danger lurking here: scorn for the body. Various false religions, as well as some within Christendom, have come to view the body as a prison for the soul. Death to them means release from prison, and an afterlife as a naked spirit free from bodies. That’s going too far in the other direction. The fact is that both bodies and souls are gifts of God. God created Adam and Eve with both bodies and souls before the fall into sin. That sets us apart from all other creatures. Jesus honored our bodies by becoming flesh Himself in order to redeem us, body and soul. He subjected Himself, body and all, to God’s wrath on the cross so that we might be spared. Buried in the tomb, He sanctified our graves with His body which did not see corruption. Then He rose from the dead, body and all—and ascended into heaven, body and all. So if the Lord created your body and redeemed your body by His death and resurrection, it is not be an object of scorn. It remains your tent for as long as you remain in this world. It remains a temple of the Holy Spirit, for you are a redeemed child of God. This can be a difficult truth. I think of Paul, who suffered from health issues for many years, the last twelve at Good Samaritan. At times, I’m sure, his body seemed a prison from which he wanted to escape. And in a sense, though there is grief at his death, there is a sense of relief when Paul was finally delivered from his afflictions. But I think it is important to make a distinction: his body wasn’t the problem—the affliction was. Similarly, his life was never a burden—the affliction of his body was. I think that distinction is important: if you regard your body as the problem, then you will despise the body that God has created for you, perhaps even curse it. But if you regard the wages of sin as the problem, then the toll it takes on your body will lead you to ongoing repentance of your sin and trust in Christ—Christ who by His forgiveness delivers you from sin and death into life everlasting. This is what St. Paul is getting at in our epistle: “For we know that if the tent that is our earthly home is destroyed, we have a building with God, a house not made with hands, eternal in the heavens.” Your tent—your body—here is going to fail and fall apart unless the Lord returns soon. But that is not the end: you have eternal life in heaven, and you have a building from God. A building—not a temporary tent, but a building. Your body, just better—perfect, in fact. Better than it ever has been here. Free from corruption. Forever. St. Paul goes on: “For in this tent we groan, longing to put on our heavenly dwelling if indeed by putting it on we may not be found naked. For while we are still in this tent, we groan, being burdened—not that we would be unclothed, but that we would be further clothed, so that what is mortal may be swallowed up by life.” Your body in this world is going to make you groan—it takes a beating and it falls apart. But you don’t groan to be released from a body—you eagerly await to be released from the burden of sin on your body. Heaven isn’t being unclothed so that you’re just a naked soul or spirit, but it is being further clothed in an incorruptible body that lasts forever. Why is this so? St. Paul tells us: “He who has prepared us for this very thing is God, who has given us the Spirit as a guarantee.” That’s quite a verse right there: God the Father has created your body, God the Son has redeemed your body, and now God the Holy Spirit is given to you as a guarantee that eternal life in an eternal body with eternally good health is yours. All three persons of the Holy Trinity are at work for you—soul, spirit and body. 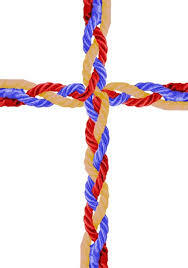 And if the Triune God is at work for you, no wonder St. Paul can go on and say, “So we are always of good courage. We know that while we are at home in the body we are away from the Lord, for we walk by faith, not by sight.” For now, you don’t see the Lord. You see the pills you have to take, the hearing aids you have to wear, the cane or wheelchair you have to use, the smudge on the MRI that means trouble. You see the casket at the foot of the sanctuary that bears Paul’s earthly remains and it reminds you that one day it will be your body in the casket and your family sitting in the front pews. But you are still of good courage, because you know that he and you are fully redeemed by Christ. And so now, by faith, you know though he is away from the body, St. Paul, your dad, grandfather, relative, friend, neighbor, our brother, is at home with the Lord. He has gone to the place that Jesus prepared for him with His perfect, obedient life, His sacrificial death, victorious resurrection, and glorious ascension. He rejoices with the angels, archangels, and all the company of heaven in the New Jerusalem, where there is no more weeping and distress, no disease or death, awaiting the day of resurrection and the new heavens and the new earth. And as for you, you live in this tent—and you groan and you grieve. But walking by faith, you know this: you are among those for whom Christ died. Solely for His sake, this tent of body and life are not the end. Only by His grace, the heavenly home is yours. Take heart, dear Christians, and be of good courage in suffering and grief: the day of the resurrection lies ahead. Your mortality and groans will be swallowed up by life everlasting, because you are forgiven for all of your sins. July 17, 2018 July 13, 2018 Rev. Robert Moeller, Jr. In the sermon text, Jesus was Grace to you and peace from God our Father and the Lord Jesus Christ! At times like this, we are reminded of two days that are particularly and especially before us. One of those two days is the day of the funeral—today. As you well know, there have certainly been a great number of things to do and decisions to make since a week ago Friday when the Lord took Sarah to Himself in heaven. There have been numerous preparations in order that the grave site committal could take place and for this funeral service. Fortunately, Sarah had been preparing for this day and service. She wrote most of her own obituary (although since she was much too modest, Patricia had to add a few things like the variety of sports she played: tennis, bowling, and an industrial baseball league just a step below the one like in “A League of Her Own.”) Sarah chose some of the pictures she wanted to share and indicated she wanted to be buried at Fort Snelling with her husband, Ray. More importantly, Sarah helped to prepare for our worship service today. She selected the hymns she wanted us to sing, the readings that you have just heard. She wanted all this worship service to focus on Jesus Christ—Christ crucified for our sins and raised for our justification. Though it is never easy to plan a service for a loved one, this certainly made it a lot easier for you to get all the preparations ready for this day. The second day we all face is much more difficult to prepare for. In fact, it is an impossible day; and to make it even more frightening, no one can tell you what day it is. It is, in all likelihood, a different day for each one of us here. For Sarah, it was a week ago last Friday, the day of her death. What day will it be for you? What is your death day? I can’t tell you. It might be today; it might be ten years from now. Left all alone, with only yourself and your death day ahead of you, … well … there is no way to prepare for that portal called death which leads to eternity. Indeed, without God there is only eternal destruction and condemnation on the other side of your death day. In the darkness of this day at hand and that day ahead of us, such thoughts are more than troubling … they are terrifying! Let not your hearts be troubled. Believe in God; believe also in Me. In My Father’s house are many rooms. If it were not so, would I have told you that I go to prepare a place for you? And if I go and prepare a place for you, I will come again and will take you to Myself, that where I am you may be also. And you know the way to where I am going. Thomas said to Him, “Lord, we do not know where You are going. How can we know the way?” Jesus said to Him, “I am the way, and the truth, and the life. No one comes to the Father except through Me. We are not able to make the preparations necessary to enter into heaven and the eternal Paradise that God wants us to have in His presence. Each one of us is a sinful human being who daily sins much in thought, word, and deed … by what we do and by what we don’t do … by what we say and what we don’t say … by what we think and what we don’t think. Hour after hour, week after week, year after year the burden of sin builds and there is terror as we consider just what we deserve from the holy, just, righteous God. For those who take their sinfulness and their sins seriously, to say that our hearts are troubled is an understatement. If left to ourselves and our own devices, our outlook would be hopeless. The Lord God must make all the preparations if we are to be with Him forever. Jesus is God, just as the Father is God. God prepared your redemption when He died on the cross. His words, “It is finished!” indicate a complete payment and accomplished salvation for you. Truly, truly, I say to you, Jesus is our Redeemer and He has made all the preparations for you to be with Him in Paradise. God baptized Sarah into Christ’s death at Oak Grove United Presbyterian Church in 1930 and her death became His death and His death became her death. Sarah died that day of her Baptism. She was crucified with Christ and from that moment on, it was no longer she who lived but Christ living in her; and the life which she then lived in the flesh, she lived by faith in the Son of God, who loved her and gave Himself for her (Galatians 2:20). On the day of her Baptism, the Lord was preparing Sarah for a week ago Friday, the day when she entered Paradise. Please remember, the Lord God must make all the preparations if we are to be with Him forever. The Good News to you this day, whoever you are, is this: God has done it. Let not your hearts be troubled. In order to accomplish your salvation, Jesus rose again from the dead on the third day … on what we call Easter morning. Neither death nor the devil nor the grave could hold Him. He has defeated them for you. God granted Sarah her first resurrection when He baptized her with water and the Word. She was buried with Christ through Baptism into death, that just as Jesus was raised from the dead by the glory of the Father, even so she also walked in newness of life from that moment (Romans 6:4). On the day of her Baptism, the Lord was not only preparing Sarah for a week ago last Friday when she entered Paradise, in that first resurrection of Baptism, the Lord was also preparing Sarah for the Last Day and the resurrection of her body to live everlasting. The Lord worked faith in Sarah’s heart in Holy Baptism. Attending worship regularly, she heard the proclamation of the Gospel and God granted her faith to believe in Him and His promises. The Lord, through His Word and Sacrament, sustained and strengthened the faith that He created in Sarah throughout her life. You need only look at one of Sarah’s Bibles to see how much she treasured the Word of God—there you will see evidence of how she prayed for her grandchildren and great-grandchildren each day in morning and evening devotions. A few days before her death, Sarah partook of Christ’s body and blood in the Lord’s Supper for the last time here on this earth. A week ago Friday, the Lord who had prepared a place for her at His banqueting table in Paradise, received her unto Himself that where He is, there she is also now. So she and Ray are together once again and their voices hymn among the angels, the archangels, and all the company of heaven singing the never-ending liturgy of the Church Triumphant. Therefore, let not your heart be troubled. preparing His followers for what was ahead for Him—for His awful suffering and His cursed death on the cross. He knew that His disciples would need hope in the days that followed. Therefore, He tells them about His ascension … about not only dying and about not only rising from the dead, but also for His ascension in and to heaven. Thus Jesus speaks to you and thus did Sarah want you, this day, to hear these words of hope and comfort. Let not your hearts be troubled. Believe in God; believe also in Me. In My Father’s house are many rooms. If it were not so, would I have told you that I go to prepare a place for you? And if I go and prepare a place for you, I will come again and will take you to Myself, that where I am you may be also. And you know the way to where I am going. “No one comes to the Father except through Me.” That is neither threat nor law. It is a promise. That, dear people, is pure Gospel … pure Good News. Everything of God has its source in Christ and is reached through Christ. Jesus is the Way, the only Way to the Father. Jesus is the Truth. We can trust Jesus because all that is real and true is found in Him. He is God the Word, and through His Word He reveals His salvation. Jesus is the Life, the source of physical and spiritual life. Whoever believes in Him has eternal life. March 27, 2018 March 26, 2018 Rev. Robert Moeller, Jr.
Each of you here today has a special connection to Jerry and/or his family. That’s why you’re here. You’ve loved him, liked him, lived with him. You’ve worked with him in his role as City Finance Officer; he has been your neighbor or friend or family. For over forty years, I had the privilege of calling Jerry my friend, one of my best friends. The first time I met Jerry was at South Dakota Agriculture Youth Institute in Brookings. We were assigned as roommates. The first thing Jerry said to me was “I need to tell you that I’m a diabetic so that if you walk in here and see me with a syringe you don’t think I’m a junkie.” A couple of years later, we were roommates as we attended the ag program at Mitchell Vo-tech. When I was foolish enough to binge drink tequila the night of my twentieth birthday, Jerry was one of the only ones to stay at the hospital until my parents got there. We served as attendants in each other’s wedding. And he was a godparent for my youngest daughter. As the years went by, Jerry and I didn’t see each other much, (too often it seems that when we did it involved doctors or funeral homes,) but whenever we got together, it didn’t take long to pick up right where we left off. Jerry and I saw each other at our best; we saw each other at our worst. And I suppose from a worldly perspective this must be about the worst. I was surprised, but not totally shocked, to receive the call from Chelsea that Jerry had died. After all, Jerry had battled with health issues for most of his life. But I didn’t realize just how ill Jerry was, and I feel bad about that because it would have been good for us to have another visit—to catch up on life, and to catch up on things eternal. Now, I feel a little like the disciples and Mary and Martha thought of Jesus when His friend, Lazarus, died; that it seems like I’ve shown up a few days too late. But I’m thankful that Jerry requested me to lead this service. Through the years, Jerry and his family have been in my daily prayers, and I pray that God would use this time so that the Son of God may be glorified through it. While I no longer have the opportunity to speak with Jerry, I do have the opportunity to speak with you, to share the only words that can bring true comfort in a time like this. “Do you believe this?” He asks Martha, looking for an extemporaneous confession of faith. But a cemetery is a hard place to confess. It may be an easy place to open your eyes and weep, to open your mind and reminisce, to open your arms and embrace. But it’s not an easy place to open your mouth and say, “I believe in the resurrection of the body and the life everlasting.” A cemetery is a hard place to confess. At least, that is the way it seems to be, the way it looks to the naked human eye. Looks, however, can be quite deceiving, can’t they? The naked human eye sees the cemetery, the coffin, the corpse, and man is easily deceived into thinking death has won once again. Ah, but therein lies the problem: the naked human eye. What that naked eye needs is clothing, that kind of clothing that will enable it to see through the deceptions of death, to see beyond the cemetery, the coffin, and the corpse, to the resurrection of the body and the life everlasting. What that naked, human, easily deceived eye needs is to be clothed with these words from the mouth of Jesus, “I am the resurrection and the life. Whoever believes in Me, though he die, yet shall he live, and everyone who lives and believes in Me shall never die.” A cemetery may be a hard place to confess, but with that simple confession, a cemetery is no longer seen as a place of defeat, but a place of victory in our Lord Jesus Christ. Just ask Mary and Martha. These two sisters, also friends of our Lord, sent for Him when their brother Lazarus fell ill. They waited and they waited, and finally He came. But it was too late (at least it seemed that way). Lazarus was already dead. The sickness had moved too quickly, and Jesus had delayed coming until Lazarus was not only dead, but buried and in the tomb four days. “Do you believe this?” Jesus asks. Martha responds, “Yes, Lord; I believe that You are the Christ, the Son of God, who is coming into the world.” Martha doesn’t know what that all means, but she trusts that Jesus is the Savior. Jesus goes to the tomb, deeply moved and weeping. Behold your Savior, the God who cries at funerals. Even though He knows He will raise Lazarus from the dead in just moments, He hurts with Mary and Martha because they hurt. Please be assured: As we gather here today, Jesus hurts with you as well in your grief. Who Christ is will become clear in that cemetery near Bethany. Martha didn’t want the stone rolled back; Lazarus had been dead four days. But at Jesus’ insistence, she relented and the tomb was opened. Truth be told, amid that crowd gathered at the cemetery, the only one who completely believed in Christ’s power over death was the dead man. He alone truly heeded the voice of Christ. Mary had heard, and the crowd had heard, yet their hearts were still crowded with doubt and grief. But the dead man, he believed; Lazarus heeded the Word of Christ. “Lazarus, come forth,” Jesus called out. And so he did. He, who is the resurrection and life, who is resurrected, raised Lazarus. The man who had died came out of the tomb. That dead man who now lived was a living trophy of Christ’s victory over the enemy called death. A cemetery is a hard place to confess, unless standing beside you is the One who stands triumphant upon the neck of death. That place of graves is a hard place to confess, unless He who rose from His own grave lives within you and within the one whose body is laid to rest. This is true, not just in a cemetery, but in any place in this fallen world in which we see with the naked human eye only loss, heartache, and defeat. In those places, that naked, human, easily-deceived eye needs to be clothed with these words from the mouth of Jesus: “I am the resurrection and the life. Whoever believes in Me, though he die, yet shall he live, and everyone who lives and believes in Me shall never die” (John 11:25). You are mourning right now. And some of you will be mourning for years to come. When a man like Jerry Jones goes out of your life it leaves a hole. But I pray that this text gives you comfort. Christ has died and Christ is risen from the dead. He is not the resurrection and the life only in the past, as if He retired from that after raising Lazarus from the dead. He is not the resurrection and the life only in the future, on the Last Day. He is the resurrection and life, now and forevermore. The resurrection at the font is a greater miracle than the one of Lazarus at the tomb: Jesus gave physical life back to Lazarus’ body, but that life would be lost again—Lazarus’ body would die again. Jesus gives eternal life to you in the water and Word. Unless the Lord returns, your body will eventually die. Baptized into Christ’s death and resurrection, your soul will not: you are alive forever, and the Lord will raise your body up, too, on the Last Day. The peace of God, which passes all understanding, keep your hearts and minds in Christ Jesus. Amen.